Ever since I was introduced to Liz's (Arty McGoo's) amazing painted cookies, I have wanted to try painting cookies myself. I'm so glad I finally got around to it because I thoroughly enjoyed myself! I sort of felt like a kid trying out watercolors for the first time, but instead of paints I used paste food coloring, and cookies instead of paper:) I'm no artist, but I sure had a lot of fun! The cookies were prepared as usual, but outlined and filled in with white royal icing only, which was the perfect cookie canvas. I allowed the icing to dry overnight to make sure they were good and dry before I attempted to paint them. I also viewed Liz's fun video tutorial again about painting cookies, which helped tremendously! I have a collection of honey pots and one of my favorites (you can see part of it in the photo above) provided the inspiration for my beehive cookies. I did use a couple of edible markers for adding some of the details. If was fun to experiment and try something different in the cookie decorating department! I will definitely be painting cookies from time to time, as well as sticking with the colored royal icing decorating. If you like to decorate cookies, and you haven't tried the painting technique yet, I highly recommend it! Thanks for the inspiration Arty McGoo!!! I wanna try, I wanna try! Looks like a lot of fun! Do you dilute the food coloring or just use as is? I diluted it a bit, but always blotted the excess water on paper towels. If it's too wet, it may ruin the royal icing. I love your painted beehives. I tried painting on cookies when Renee at KudosKitchen was doing it and decided it was best to put the idea on the shelf for another day. Liz is a fabulously talented artist and everything she creates is stellar. Love her work and she is such a fun and engaging personality. I only wish I could work with food colouring on cookies 1/10th of what she does. I hope to see many more of your painted cookies in the future. Great job! Every time I think you can't come up with anything cuter, you do! They look like a lot of work, but they are just gorgeous. I love these and that's exactly how my paper towel looks when I paint on the cookies too!! you have done a great job. I have been inspired by this technique from Arty as well. Sophia and I have experimented around on store bought cookies for something to do and we had a blast. These cookies are quite amazing, Sue!! Wow, how beautiful. The're fantastic Sue, therefore you are totally an artist! This sounds like so much fun. Can't wait to give it a go! I totally love these! Painting with paste colors, fun right?? Love that you captured your real honey pot! I'm going to say that you ARE an artist!! These are so much fun Sue. They are so bright and cheerful, I bet it was tons of fun! Check my Kitchen Fun Linky Party project! I hope you didn't have to make too many - they look like a tremendous amount of work! They are fantastic! Amazing!! You are a natural at painting on cookies! I never would have guessed it was the first time you painted on cookies. Thanks for adding them to my link party! These are just fabulous. I love the colors. I love the designs you came up with! This is amazing! This is the cutest thing I have seen all day! I love it! Those are adorable, love the idea of painting cookies! Thanks!! How fun and I just love the peek we got of your beautiful beehive that inspired these incredible cookies. I think this would be very very therapeutic! I could have used these on my beehive table last week. They would have fit in perfectly. I learn a lot from you every time I read your blog. This is brilliant. I will know what to do now if I need to paint my cookies. What a beautiful bunch of beehive cookies. I was thinking, a honey cookie would be great for these! That said, I tried painting on dried royal icing with food color years ago when I glued fondant bows with it, and the food color (gel paste) softened the royal icing to the point where the bows fell apart. Is there a certain food color brand that's better for royal icing? Hi Lisa, This was my first cookie painting experience and I used Wilton. These are just so beautiful and feel like spring. I've painted macarons before, but never this kind of cookie. This would be a really fun project for kids too! Only they surely wouldn't end up looking like your beautiful cookies. Thanks for this idea! P.S. You're not artist? Oh yes you are! You ARE an artist! Everything you do is beautifully put together, you have such an eye and a talent for making things gorgeous and fun. I love the warmth and rusticity the painting lent this project. Perfect subject! You are amazing! They're all so perfect! Fabulous, fabulous job! The beehive cookies turned out amazing! They look so real! These are fantastic Sue! 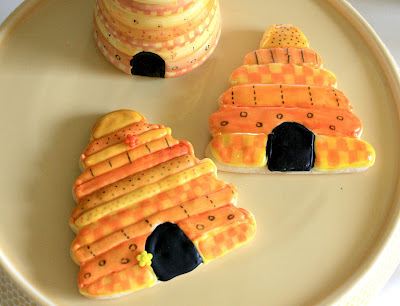 Of all the bee and beehive cookies out there, these are high on my list! The cookie painting adds such dimension and uniqueness that just can't be achieved with plain icing! Good for you for going after it and being successful so fast! I have yet to brave this technique!